Egads! My husband Won't Let Me Change The Blue Trim Color! Egads! My husband Won’t Let Me Change The Blue Trim Color! I recently received a real “dear laurel” letter. Not that he can’t still honor her memory with special keepsakes. That’s beautiful and appropriate; but turning your home into a museum to honor her memory at the expense of his wife’s happiness is really kind of ick, IMO. There are many ways that he can honor his mom that are appropriate such as a 30 x 40 portrait of her over your bed. One of the hottest trends going, that I happen to love is painting the wall and trim the same color. But… This is actually not just a trend but is historically accurate. It was very common to paint the walls and trim the same color back in the 1700 and 1800’s! Of course, the following rooms were all painted recently, but are in the style of 2 or 3 centuries ago. These may not be the same shade as your blue trim color but the idea is that it’s an option. If one has to deal with a yucky color, paint everything the yucky color and it will be less yucky. Please enjoy the following examples of what I’m talking about. Of course, many of these images may not address your issue of wanting to make the room lighter and brighter. 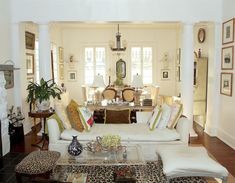 But if it’s not a light and bright room to begin with, it won’t be no matter what; so it’s better to go with what is and create lightness with furnishings and lighting. Fabulous traditional dining room where everything is painted out in the rich blue-gray. Of course, this room is an architectural gem. 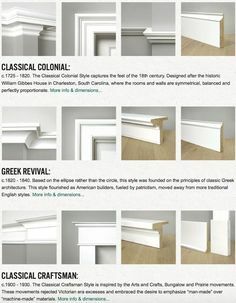 photo: Susan Simonpietri via: Chang and Co.
Hope that you found this to be helpful. If not, I guess you could just set fire to the place and start over. The Laurel Home Essential Paint Color Collection. We Live Like Squatters | We don’t Even Have Anywhere To Sit! Yes, some are having this problem. It’s a technical glitch that I’m hoping to have sorted out soon related to my getting an SSL certificate. In the meantime, please use this link and you’ll be able to see the images. Excellent advice. 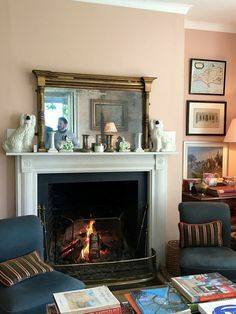 Same color walls and trim is an elegant Parisian look — its a hard sell here in the South because we GRITS (girls raised in the south) love our white trim and moldings. If her MIL’s home is rustic country, and the trim is rough wood that isn’t even sanded well (don’t get me started), the look may not work. It’s tres chic in traditional and historic homes with sophisticated trims and moldings, but that blue trim is often seen in primitive country interiors, and truthfully, it’s right up there with Smerf regurgitation. 1) If you really can’t stand the blue color, and he won’t go for white, see if you can meet in the middle with a pretty light gray or taupe. 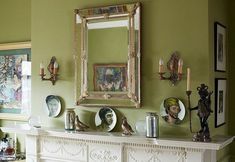 2) Tell him you are painting the trim to something you can live with and in exchange he can have one room left as is, to pay homage with the decor — like a den or office. You can close the door and you’ll both be happy. 3) Have a professional designer come for something else like window blinds, and nonchalantly ask him/her what they would do with the room, in front of your hubby of course. If you’ve prepped him/her, they say what he needs to hear. Haha! 4) Before and After example photos from Houzz, Pinterest, etc, work too. He will start to pick up on how much of an improvement it could be. Such sound advice Laurel and hopefully it will assist Julie. Favourite room of mine has to be by Welhil Interior with the amazing architectural details and fabulous elements. That said; the artwork of the deer (Sheila Bridges room image) almost appears to be a reflection in a mirror’ don’t you think? Okay perhaps it is just my imagination running away with me as doubtfully it is even a family portrait … ☺. In conclusion; IMHO the application of a non-glare glass would have been appropriate and I do love the charming ceiling fixture. I hear you. And ahhh… I’m so sick of our harsh winters that I have fantasies of living some place warm all year round, or at least not so freezing in winter. Great, you’re close to Mom now and can see her much more often. I bet she’s thrilled about that too! I would be! Gorgeous examples, great advice. Sometimes your best bet is to embrace whatever quirks are in your home, so your home will embrace you back. That’s good to know. And actually, the color can always appear a little different, but it’s usually a good thing. Maybe, in your situation it wasn’t, so something to look out for. Pretty and elegant solution. The images you chose are wonderful. All good hypotheses. I was also thinking that Mom’s husband let her do what she wanted, so why not the son? I debated including other colors, but since we’re talking blue and green trim, I kept it to that family. I love the look of all one color.